Aerojet Rocketdyne has started a series of 10 firing tests of an engine designed for use on Boeing’s Phantom Express unmanned vehicle as part of the Defense Advanced Research Project Agency’s Experimental Spaceplane program, SpaceNews reported Tuesday. 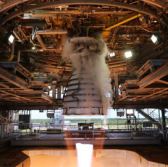 The company performs the 100-second test firings of the AR-22 engine at NASA’s Stennis Space Center in Mississippi for a period of 10 days and has completed six tests as of Monday. “We’re taking and making use of existing hardware, most of it being flight proven,” Jeff Haynes, AR-22 program manager at Aerojet, said of the engine. DARPA partnered with Boeing in May 2017 to help design, build and test a reusable spaceplane through the XS-1 program. Steve Johnston of Boeing said the company has begun development of flight hardware with plans to hold an overall vehicle review by early 2019 and flight tests by 2021.